Fritz has literally grown-up in the foodservice industry, since his father founded White Feather Farms back in 1972. He started out as a teenager mowing the grass and washing trucks during his summer vacations from school and upon graduation has done every job in the company including delivery driver, sales, warehousing, purchasing, maintenance, and book keeping. Today Fritz is the President of White Feather Farms and takes great satisfaction in helping our customers find just the right product for their needs and then delivering it on time at the right price. In his free time Fritz is an avid motorsports fan and can often be found at the races, attending a cruise-in, or taking our 1924 Model-T Ford to the local Farm Market. Founder, Vice-President and co-owner with son Fritz. Established White Feather Farms as poultry and egg distributor in February of 1972 after eight years of employment with Ralston Purina Co,. Checkerboard Farms, Egg Division. Growing up the son of a feed salesman, Bill has strong AG background especially in poultry and a lifetime of knowledge gained doing any and all jobs needed. As a laborer, warehouseman, truck driver, salesman, plant manager and finally business owner Bill understands the challenges facing small business and has dedicated White Feather Farms to serving their needs. White Feather Farms is a small family owned business, owned by my husband of 42 years Bill. We have a son Fritz who is now President of White Feather Farms and two daughters that live out of state, Jennifer and Christine. We also have three grandchildren, Margi, Julia and Andrew. I started working part-time at White Feather Farms in 1989 after our children graduated from high school. I work in Accounts Receivable and help in the deli or where ever I’m needed. I find you meet a lot of nice people that shop at our store. The employees are a great group of people to work with. Michelle joined the White Feather Farms family in 1999. As an inside sales representative, Michelle has the privilege of interacting with many of our customers on a weekly basis. Having had the continuous contact with many of these customers for several years has allowed Michelle to form a bond with these customers. Michelle has attended several Golbon training seminars and is a 2007 graduate of Tyson University. She has been awarded twice the Golbon Merchandising Excellence Award for outstanding performance in Purchasing and Merchandising. In her spare time, Michelle is a Girl Scout troop leader/camp director and enjoys spending time with her family. Michelle has two children, Jamie and Dylan. 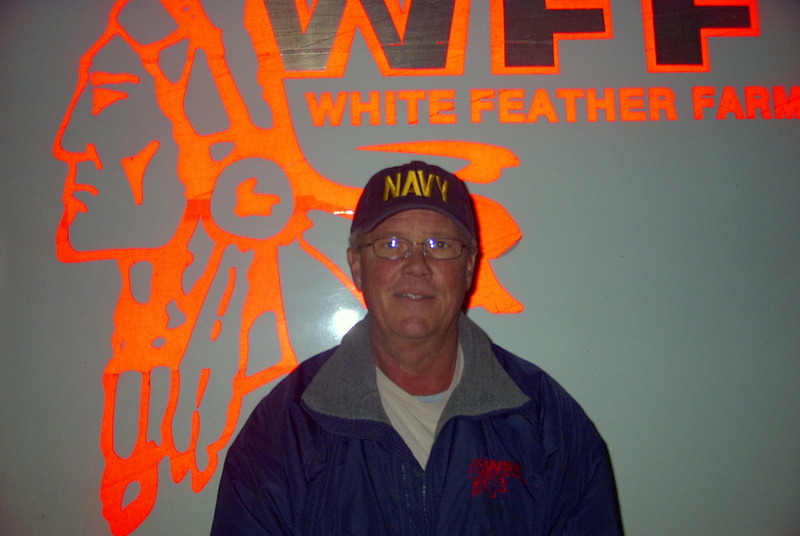 John has been a White Feather Farms delivery driver for the last three years. Prior to coming to White Feather, John was employed by Lancaster Poultry for 17 years. In John’s spare time he is an avid bowler, loves to read and is a member of the First Church of the Nazarene in Lancaster. Matt has been a White Feather delivery driver for 7 years. With over 30 years of delivery service experience, Matt enjoys meeting and working with people. Matt is an avid Ohio State and Cleveland Browns fan. Matt enjoys spending time with family and friends and is a very proud parent of a US Navy sailor and grandparent to four beautiful grandchildren. 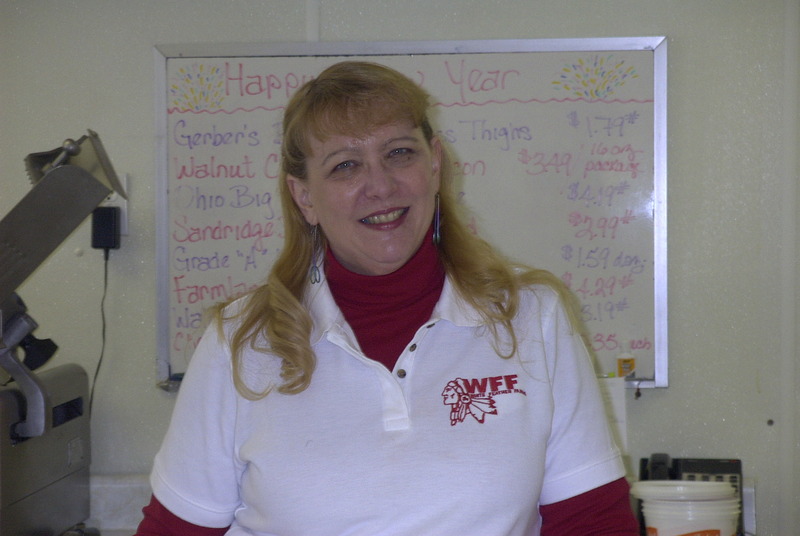 Bunny has been with White Feather Farms since 2006. She has been married 55 years to her high school sweetheart. They have 2 children, Kevin & Debbie who they are proud of and a special daughter-in-law Brenda, and 2 wonderful grandchildren Samantha & Tony. In her spare time, Bunny likes to fish, golf & spend time with friends and family. Bunny has a nice relationship with our customers, sharing recipes and offering samples. Connie is the newest member of the White Feather Farms deli family. She has lived in Pataskala for the past 7 years, previously she lived in Gum Spring, Virginia where she worked in banking. She has 2 grown children and 3 grandchildren. Connie has lots of experience in the customer service field and loves interacting with our customers daily. Sandy has been working in the retail deli store for almost two years. Sandy is married and has 2 children. Sandy is actively involved in giving back to the community through her membership in the Reynoldsburg VFW, the Ladies Auxiliary of the VFW and the Lady Knights of Columbus. Her family donates time to the Reynoldsburg Tomato Festival and at the end of June every summer, you will find her volunteering at the Special Olympics of Ohio Summer Games. Sandy has lived in Reynoldsburg for 24 years.